In the spirit of public Q&A, I’m sharing an intriguing question I received recently from a community colleague. Check out my answer and then add your ideas and suggestions in the comments below. Do you know of any particularly good or interesting services to empower patients in their relationships with doctors, especially ones which involve storytelling, ratings, complaints, word of mouth, etc? As you might imagine, there is a ton of ad hoc conversation among patients about clinicians — on Facebook and every other social media platform, on old-school list-serves, offline, etc. I’ve tried to measure it in the past by asking national survey questions about general info-seeking and sharing behaviors as well as more specific questions about review sites. But it’s like the proverbial “what’s water?” for some people — the conversation is so casual, so usual, that they don’t note it happening. In my own online community of food-allergy parents, clinician recommendations and advice about how to approach a clinical conversation are consistently popular topics. People weigh in with details about the quality of the support staff, where to get blood tests done, etc. It has absolutely improved my son’s life to be cared for by a different allergist than our original one and for me to learn about how to advocate for him. It’s part of my concern about the replication of the haves & have-nots in our society — the information- & resource-rich get richer as we navigate the maze faster and faster. Meantime, there are kids who haven’t even been appropriately screened for their allergies, much less given access to cutting-edge therapies. One aspect that’s been studied and is worth the time to consider: personal agency. There’s a tool called the Patient Activation Measure that asks people a set of questions and gives a score about how likely they are to speak up, to ask questions, to take their meds, to show up for appointments, look for a new clinician, etc. If you are depressed, for example, you are less likely to do all these things and so your health spirals down. A big opportunity in health care is finding ways to boost people’s sense of personal agency. I’m interested in the Maker movement because of its ability to spark engagement in problem-solving and am always looking for ways to infuse health care with that spirit. Can someone’s sense of agency in building or fixing a physical piece of hardware, like an assistive device, translate to empowerment in solving another kind of health-related problem? Voro is a peer to peer clinician recommendation service that uses Facebook to verify people’s identities. They are small, but building their reach community by community. Are peer recommendations for specific clinicians the sort of empowerment you are thinking of? Smart Patients, Inspire, and PatientsLikeMe are thoughtful and well-designed online patient communities. The platforms invite participation and storytelling and do a beautiful job of threading and archiving (which Facebook does not, for example). Advice about how to empower patients in their relationships with clinicians is a by-product of participation in each community. Another avenue: Talk with community organizers. Antwi Akom, co-founder of Streetwyze (among many of his pursuits), would be an interesting person to talk with about how to empower people to speak up about clinicians in their communities. The National Domestic Workers Alliance is another community organizing to help people use their voices to demand change. What other sites, resources, and people would you add to this list? Please post ideas and suggestions in the comments! 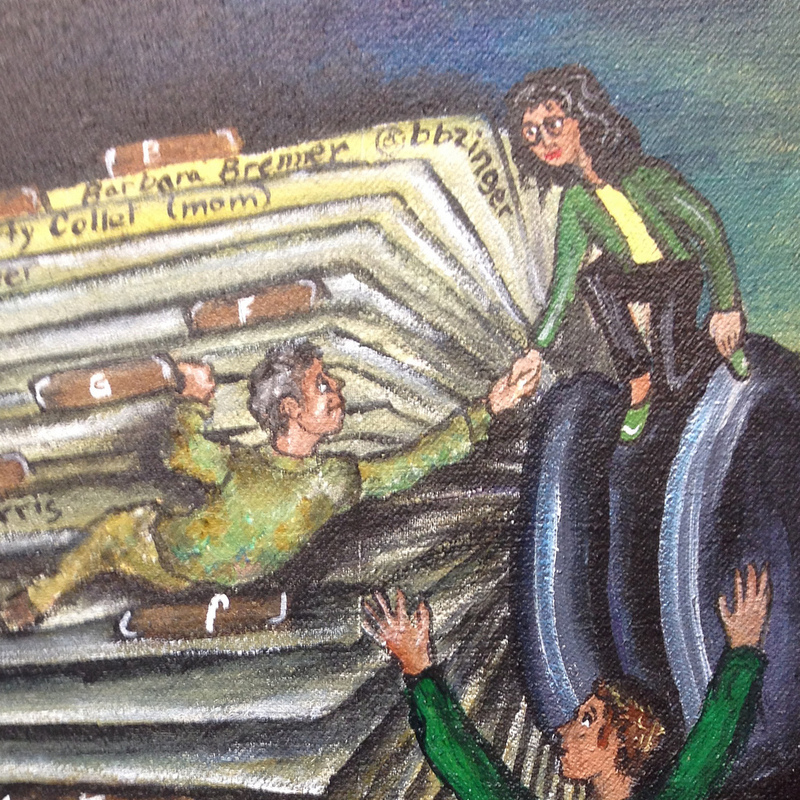 Featured image: Detail of “The Rolodex” a jacket for Cathy Collet by Regina Holliday. 1. Nurses from the Epilepsy Monitoring Unit learning from patients what the patient experience is like being attached to electrodes waiting for a seizure to happen so that they help patient keep their sense of control and avoid unnecessary suffering. 2. Transplant recipients talk about staying healthy post transplant, which become a blog, which became a patient education video. There’s so many more examples. The magic of conversation and connection never stops. Fabulous! Thanks so much, Colleen. The danger of posting my answer is that I expose my oversights, missed opportunities, etc. I should have include the Mayo Clinic communities in my original response. I love the campaign that Bertalan Mesko started: Ask Me About Digital. Physicians wearing the Ask Me About Digital sticker encourages their patients to ask about information they find online; the health/medical smartphone apps, trackers or sensors they use. These are physicians who know about the digital world and are open to having a conversation about it. I’d love to see physicians get behind this. Love this example of strengthening the clinician-patient relationship, using the opportunity of an otherwise-silent or in-the-shadows or too-quick “you’re probably going online” “well, yes, I am” conversation to spark a deeper partnership. Over in the Society for Participatory Medicine this has recently been a hot topic of conversation. The SPM Connect community we set up a few years ago, combined with some new invigorated/ing members, has been looking at different frameworks. I find it important to think carefully about what we mean by “empower.” Some people think it’s to give permission: “Our phone agents are empowered to give you a refund.” No; you’ve given them permission – the power is still with the boss. Empowerment is increasing the capacity of [people] to make choices and to transform those choices into desired actions and outcomes. devolved to the lowest appropriate level. So, looking again at the question you were asked, “to empower patients in their relationships with doctors,” it starts from an assumption that these patients lack the capacity to make choices and/or to take action … mostly, I presume, the latter – how to take action, would you agree? Related: I teach the power issue to audiences pragmatically: “A disempowered person – a powerless person – is easy to recognize: faced with something unpleasant, they shrug and say ‘There’s nothin’ I can do about it….” That is the expression of powerlessness, of having no power. More in another comment, about the “agency” thing. I think you’d be pleased, btw, to see how vigorous and constructive the SPM Connect community has become, compared to the years of getting-nowhere we had. Non-members can scroll through the list of discussions in the Open Forum section. It’s still a great mystery to me, how it happens that some gatherings of people (online and off) become a robust community and others don’t. My previous comment was about defining empowerment. The companion topic seems to be “agency.” I agree with what you say about it, but a challenge in our advocacy for improvement is that lots of people (including in healthcare) don’t know this meaning of the word. The core challenge at the center of the field of sociology is understanding the relationship between structure and agency. Structure refers to the complex and interconnected set of social forces, relationships, institutions, and elements of social structure that work together to shape the thought, behavior, experiences, choices, and overall life courses of people. to think for themselves and act in ways that shape their experiences and life trajectories. Are there ways to look at the sociological structure of our world / our society that might shed light on pathways to improvement? I’m puzzled by how at the start of your list you said “here are examples of platforms organized to capture clinician recommendations.” Your colleague’s question didn’t ask about capturing clinician recommendations, did it?? Dave, thanks for all your thoughtful and thought-provoking comments! 1. One of my goals for 2019 is to write more so here I am, revving my writing engine, publishing something new every Monday at 7am Eastern (in the U.S.) and in between if something pops up (like last week’s fun a16z podcast appearance). 2. Empowerment is a word in need of definition and I like the way you frame it. Thank you for bringing in the World Bank definition. Further amplification of my suggestion to expand beyond health care into, for example, community organizing and labor organizing spheres. If other people have ideas about where else to look for insights, please add them! 3. Structure and agency — whoosh, that is getting at the heart of the issue. Will ponder and add — and I invite others to do so, too. 4. My friend’s original email subject line was “Doctor ratings”, so that’s part of the explanation for why I focused on clinician recommendation platforms. It’s also because those are the sorts of communities I happen to know about, so they came easily to mind. As I wrote to Colleen Young above, the danger of posting my answer is that I expose my oversights! And I’m grateful to everyone for helping to fill in the blanks and add their insights. OMG, ambiguity fail! I thought you meant sites that collect what clinicians had recommended, not recommendations by patients, of clinicians. I’d recommend: Healthcare Choices: 5 Steps to Getting The Care You Want And Need. (https://amzn.to/2puldX4). It lays out a repeatable process (the 5 step CARES model) for participating/making healthcare decisions. Here’s the cliff notes: Patients believe that the doctor is the expert. They are….medically. But the PATIENT is the expert in their own preferences, priorities and values – and both experts need to have a voice in care decisions. While this sounds intuitive…most of us don’t speak up because we don’t know where to start and don’t have a process/method for HOW to identify our preferences, priorities and values. The CARES model is a simple decision-making framework. No technology necessary. Thanks Susannah, I want to add to Dave’s enthusiasm for your frequent posting: I love it! Also similarly to Dave, I am struggling with the word “empower”. Maybe it’s a language thing but there actually isn’t a Swedish word for “empower” so maybe that’s where my frustration starts. In my opinion “to empower (someone)” sounds patronising and passivating, maybe even deliberately so. In my mind: “empower” has a reflexive action to it and just as you can’t “learn” someone else, you can’t “empower” someone else. Sara, what sort of words are / were used in the women’s movement? Where Americans might say “… to empower women,” what would Swedes say? And this is why I love to blog!! I get to share a question, think out loud, and then hear from awesome people from all over the world about what THEY think. Fascinating that you say “strengthen” is a passive word (from the perspective of the strengthened person) – it’s something that happens TO the person? In a sense that’s what the World Bank’s definition says, right? “Increasing their capacity”? In my view, if I wake up one morning with a new superpower, it doesn’t matter much to me whether I grew it or my fairy godmother dusted it onto me. I have it. It’s also fascinating how different languages structure where “me” sits in the syntax. In Hebrew “I have” is said “yesh li”, which literally means “there is / to me”; “I don’t have” is “en li” (“there is not / to me”); in French “I am hungry” is “j’ai fain” (“I have hunger”), “I am 10 years old” is “j’ai dix annes” (“i have 10 years”), etc. I’d bring it down to a fundamental relationship question (because this IS all about relationships). One of the most important questions I’ve seen counselors discuss is whether you “make” someone happy, and thus whether it’s healthy to WANT to “make” someone happy … vs doing what you can to support them and create to LET them be happy. Another platform that we’re launching shortly is called Health Untangled and the goal is to simplify health by explaining basic health data through visuals so that we can better understand the data we now have access to that will ideally prompt us to take a more proactive role in our overall health and well being. Wow! Thanks so much, Sarah. And congratulations on this great work. Forgive me if this is too obvious, but MyOpenNotes and the open note idea seems tailor made to give patients engagement in their clinic visit. Nothing is obvious in this sector — I think Open Notes is indeed a great tool to boost up in the conversation about the structure of the system and providing pathways to agency. Thanks! As you know this is where my passion lies – helping patients be seen as experts in their interactions with providers. Woo! Also want to second OpenNotes!! And their new iteration, I believe it’s called My Notes, which collects information from patients (goals, talking points pre-visit, etc) and puts it directly into their record. Thanks, Katie! Everyone else: please check out Pictal Health — here’s a direct link to the blog. I’m confused by the concept of patient empowerment. To what end are patients to be empowered? In my mind (and experiences), the goal should be not just empowerment but how do we create situations of patient/physician collaboration. All the groups and web sites and notes in the world won’t result in any more positive outcomes if patients and physicians can’t come to an agreement on common respect and the role of each. In my experiences, I’ve seen little movement from the traditional hierarchical relationships of the past. Suggestions and input are too often dismissed with indifference. Important tangential discussion is ignored. Healthcare will never evolve until the relationships at the center of it also evolve. Hi Clay! Glad to see you here as well as Twitter. > To what end are patients to be empowered? That’s why (above) I said definitions are fundamental. Definitions, as in “Wait – are we clear what we’re talking about?” If not, disconnect is predictable. My view: Empowered in order to be better able to make choices and take effective action. To have agency. Clay, thanks for joining in and raising this issue. I agree with Dave’s, Sara’s, Christiane’s, and others’ focus on definitions — expanding beyond the word “empower” to see the structure that holds us all in place, restricts our roles to the ones that have been handed down seemingly forever. I’m also interested in finding ways for people to take action, even in a small way, to start changing how they participate in a clinical conversation or interaction. To give people the language or imagery they need to accurately describe, maybe for the first time, what’s happening to their bodies. I’m also thinking about times when I personally have been given space to say what I need — fundamentally changing the way I view that kind of encounter so that I notice the next time I am NOT given space. This is tough, frustrating stuff, though, and I want to acknowledge that and your comment. Thank you. See also from WHO: Patient empowerment might be the preferred term from a patient advocacy point of view. However, the less emotionally charged and challenging term patient participation might be a term more acceptable to many HCWs, patients, and cultures. (Source: WHO Guidelines on Hand Hygiene in Health Care: First Global Patient Safety Challenge Clean Care Is Safer Care. Susannah / Christiane, wow – I don’t think anything I’ve read on a blog in ages has triggered such a visceral response to me. “More acceptable to many healthcare workers”?? Excuse me, so many patients report being oppressed / squashed / put down by their HCWs, and we’re worried about not being “unacceptable” to them?? BUT: then I realized, Christiane spoke of the WORLD Health Organization, and speaks from her own multi-cultural background. (From Köln, studied in Stockholm, etc., and is particularly attuned to cultural expectations in human-computer interactions.) If we indeed introduce this thinking into a culture that’s far earlier on the participatory evolution scale, both the oppressed and the oppressor (in our view) might find it unthinkable. Sadly, there is still a long way to go to really have a collaborative relationship / equal partnership between patients and professionals. One that respects and acknowledges that patients are experts, too. In our paper on patient accessible EHRs, we instigated a discussion that the emphasis on “empowerment” of patients can trigger an interpretation of “power” in health care as a zero-sum; meaning that a gain of power for one side (ie, the patient) entails a corresponding loss for the other side (ie, the professional). (see https://www.jmir.org/2018/1/e11/). In my opinion, more power to patients does NOT equal less power to healthcare professionals, but not everyone sees it that way. I’d like to think that terms that emphasize collaboration and partnership instead of a power struggle are more constructive. What do you think about this? Hm, now that we’ve broadened the aperture from empowerment per se to include level of participation, that shifts us to the nature of engagement. Fascinating to me that she referred to the middle rungs on the ladder as tokenism, because the citizens still have no power, no ability to call the shots if the authorities disagree. Awesome!! The person who asked the original question is bowled over by the conversation it has sparked here. Don’t worry at all about going beyond the original parameters.